eCalm improves focus, concentration and responsiveness. It is especially useful for mares with unfavourable behaviour. eCalm brings a new and novel approach to calming horses and reducing the occurrence of unfavourable behaviour. Unlike other calmers on the market, eCalm focuses it full affect on the gut. 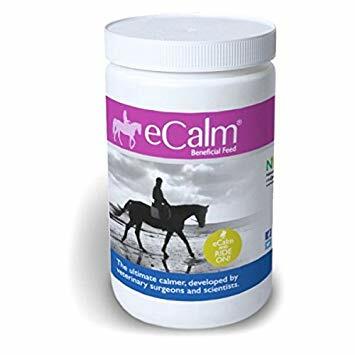 eCalm is a pre-biotic (promotes the growth of positive bacteria), this seems to have a very beneficial effect on the gut-brain axis, resulting in a positive impact on the behaviour and well being of the horse. eCalm contains Modified Wheat Germ extract- and that is all! It is tested to be free from Naturally occurring Prohibited Substances. As well as improvement to behaviour, eCalm helps to maintain gut health, overall condition, skin and coat health. eCalm has published 2 papers showing its useful effects improving the behaviour of Mares in Oestrus and ‘Geldings’ of which the behaviour was not optimal. For a 500KG horse give 1 scoop (20g) once daily in feed.